With Microsoft (MSFT) Chairman Bill Gates soon relinquishing his daily role at the software company he co-founded as it grapples with Google (GOOG), European regulators, Yahoo (YHOO), and Windows Vista critics hoping to upgrade from XP to Windows 7 (skipping the much maligned Vista entirely), tonight’s conversation with Gates and Microsoft CEO Steve Ballmer will be a memorable one in the history of the software sovereign. Walt Mossberg and Kara Swisher take the stage and offer their thanks to the audience, which they say is the heart of the D conference. Walt: Last year we had a joint interview with Bill and Steve. This year, we have an interview with another Bill and Steve. Stage darkens and we’re treated to an extended version of the “Bill’s Last Day at Microsoft” video that debuted at CES earlier this year. The high point of this version is, once again, Gates singing Jay-Z’s “Big Pimpin,” although Matthew McConaughey encouraging Gates to scream “I AM LARRY ELLISON” while hitting a punching bag is pretty great as well. I don’t remember that being in the CES reel. Scratch that. Gates discussing new malaria vaccines in his new office inside a Dairy Queen is great, too. The Iron Chef “Battle Cheeseburger” with Mario Batali ain’t bad either. Gates and Ballmer take the stage. Presumably audience has been cleared of egg-throwing Hungarian college students. Kara asks Ballmer about his early CV. Ballmer recalls his early days at Procter and Gamble, working on a product called the Coldsnap Freezer Dessert Maker. “Makes revolutionary desserts you never could have thought of before,” Ballmer says, repeating the product slogan. Ballmer soon moved on from ice cream mixes … to brownies. A better business, he says. 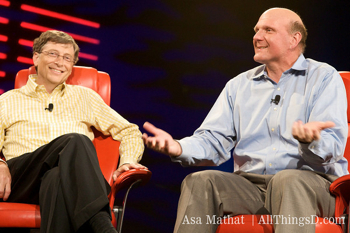 Ballmer recalls a phone call from Gates feeling him out for a job at Microsoft. Ballmer told Gates he was busy with school. Gates said, “Too bad you don’t have a twin brother,” and hung up. Ballmer called him back the next day and said, “What about me?” He left Stanford Business School and then moved up to Seattle to work with Microsoft. Kara: What was the early business like? Ballmer on Microsoft’s early hiring/management policy: Prove we can hire one good guy and we’ll worry about hiring the next two to 18. 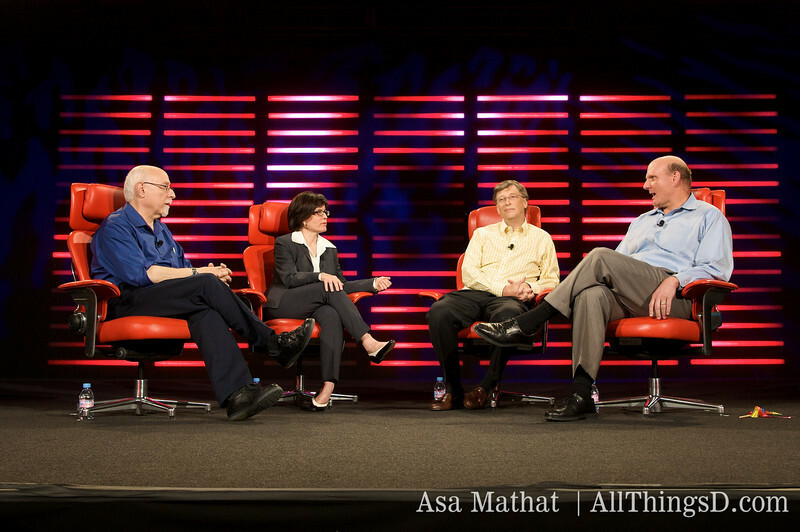 Ballmer notes that Microsoft takes all its risks technologically. “Why take risks financially?” he asks. It makes no sense. Walt notes that there are very few examples of companies being run by the same two people for as long as Microsoft has. Gates and Ballmer have been working together for 28 years. Walt notes the public perception that Gates is the product guy and Ballmer is the sales guy. Is that right? Ballmer says the two are both very detail-oriented, with Gates focusing on tech and finances, and Ballmer focusing on management and finances. Kara to Gates: So would you call yourself a businessman? Gates: “Well, sales minus cost equals profit. Is there anything else?” Big laugh from the audience. Gates is really on-point tonight. Walt notes that Gates is still chairman of the board and Microsoft’s largest shareholder, and suggests that he’ll clearly hold quite a bit of influence over the company. To Ballmer: Won’t you take some big decisions about the company–say the Yahoo deal–to Gates, the company’s largest shareholder? Kara: OK, moving on. What’s going on with Yahoo? Ballmer recites the now familiar party line: We made a bid. There was a difference of opinion over its size. We walked away. We’re now talking to Yahoo about a new deal that doesn’t involve a full-on acquisition. But we reserve the right to rebid for the company if we choose to. D staff wheels a whiteboard out for Ballmer, who begins to describe how a Yahoo acquisition would have accelerated Microsoft’s scaling up of its search-advertising business. Draws a large circle (Microsoft, I guess) surrounded by the “muscles” of Microsoft’s business: software, advertising, etc. Ballmer says Yahoo would have been an accelerant to Microsoft’s business. It wasn’t a strategy. Walt: Is there a way for you to do a deal with Yahoo that’s not a full acquisition, that would allow you to attain the sort of scale you’re looking for? Kara: Yeah, like a monopoly. Interesting. Walt: That’s a great point. That’s exactly the sort of argument that was made against Microsoft. Ballmer: Am I saying there’s something wrong? I’m just saying we are guys who will compete. That’s all I’m saying. Gates: Guys like us avoid monopolies. We like to compete. Walt asks Gates about competing with Google. Gates notes that Microsoft has pulled a team together that is working to improve search. Walt asks for evidence of that improvement. Gates says, we can see improvements in image search, etc. If that’s the case, asks Walt, why is your search market share dropping? Walt asks about Microsoft’s new Cashback program, which rewards users for purchases they make via Microsoft’s search engine. 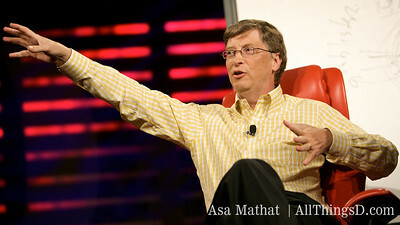 Gates says a model that rewards users for their choices is the future. Google issue comes up again. Ballmer: In our business, people think great things happen overnight. Great things rarely happen overnight. Unseating a powerful competitor takes patience. Switching gears. Walt asks about Vista and the lousy reception it’s been given. Is Vista a failure? Ballmer: Vista is not a failure. Is it something we’d like to improve? Of course. Is it something that with 20/20 hindsight we’d do differently? Sure, he confesses. But Vista has sold a lot of copies, he adds. Walt jumps in and asks about the percentage of Vista sales that result in downgrades to XP. Ballmer dodges. Gates looking a little depressed. Walt asks if Vista has damaged with Windows brand. Gates says Microsoft’s philosophy is to “do things better.” And Vista has given us lots of opportunity to do that, he notes. (Audience laughter.) There are plenty of lessons out of Vista–compatibility and other issues vendors are concerned about. Ballmer says what we’re about to see is “just a snippet” of Windows 7. Microsoft’s Julie Larson-Green takes the stage to conduct the demo. She says Microsoft is using some of the multi-touch technology from Surface (which debuted at D5 last year) to enhance Windows 7. And there it is … well, damn if it doesn’t look pretty slick. Clearly the Windows dev team’s been busy with more than just Vista service packs. Larson-Green pulls up a brand new app, “Touchable Paint.” She uses all 10 fingers to draw a tree. Then, she brings up a photo gallery. Noting that multi-touch makes it faster and easier to manipulate photos, she demonstrates … well, she demonstrates a lot of features that anyone who’s ever used an iPhone will already be familiar with: two-finger zoom, flicking through a slideshow, single finger panning through thumbnails. Moving on to photo management. With Windows 7, Microsoft hopes to create a more life-like photo experience, one that allows users to interact with digital photos as they would with their analog counterparts. New photo applications developed for the OS will allow users to arrange and examine photos as they would on a table. Also allows them to write on them and rotate and zoom them. There are some nice 3D slideshow, grid and scatter views as well. Here’s a mapping app that was modified from the Surface team’s own Concierge application. Like Concierge, it calls up data from Windows Live Local and Microsoft Virtual Earth. Nice little pan/zoom on our current locale, Carlsbad, Calif. “Search for Starbucks,” says Kara. My God, there are 83,000 Starbucks here and the city’s just 7.5 square miles. (Kidding.) Pushpins appear on-screen indicating locations. Flip over a pushpin and ba-da-bing, you’re on your way to wherever it is you’d like to go. You can conduct more specific searches, as well. Application offers both “road” and “aerial” views. You can conduct more specific searches, as well. Searching for Seaworld now. The app can provide directions as well. Larson-Green notes that what we’re seeing is an app that *might* be developed for Windows 7. This demo is all about showcasing Windows 7’s potential. Walt asks if multi-touch is built throughout the OS. Larson-Green says it is. Then, another app: Well this is sweet. A multi-touch piano. Looks almost as responsive as the one you can run on a jailbroken iPhone …. Demo’s over. But here’s a video of what was shown. Windows 7 is apparently months away, due late in 2009. 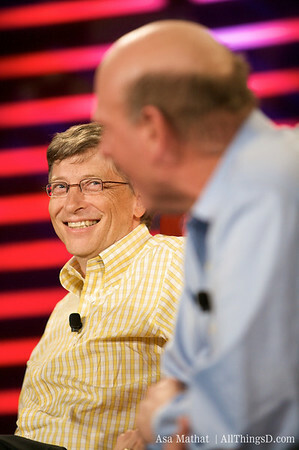 Walt asks Ballmer if he’s worried about the next iteration of Mac OS X, which will likely be released before Windows 7. Is there a risk that the work you’re doing now with multi-touch will look dated when Apple (AAPL) releases its next OS? Walt presses him, noting Apple’s recent growth in the PC market. Walt hits on Windows quality issue, noting that he’s seen old Macs running significantly faster than new Vista machines. 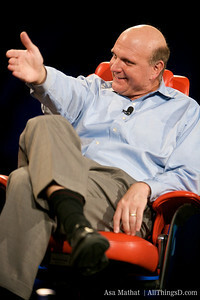 Ballmer admits there’s room for improvement: Steve Jobs has a great business, he says. His model works well. But so does ours. 10 million people like his model. 290 million like ours. Kara asks Gates how it feels to have Microsoft defined by Apple via its “I’m a Mac, I’m a PC” campaign. Ballmer: “What’s an appropriate response to that question?” Gates bristles: “You’re repeating yourself,” he says, alluding to the fact that the question has been asked already. Q: We probably spend more time with Microsoft products than we spend with any other products. Has anyone ever considered taking that engagement and leveraging it as an advertising medium? Ballmer says he’s not sure layering ads on the Windows desktop is a way to improve the Windows experience. That said, he notes, we live in a world where business must think more creatively about advertising. Gates jumps in and notes that advertising has been moved creatively to other mediums–the mobile arena, for example. But we must be careful of how we do this, he adds, because we don’t want to interfere with the user experience. Q: What is it that you did early on to find and hire good talent? Ballmer says they looked for people who were very bright and sold the opportunity to work in a company where software is very important. That philosophy remains today. Gates recalls hiring Charles Simonyi, who found Microsoft specifically because of his shared passion for software. Q from Tim O’Reilly: Microsoft has been playing “me too” these past few years, following the lead of other innovators. Do you have any “big, hairy goals” now, he asks, or do you need to? Gates says the company has an internal program called “Quest” that focuses specifically on identifying new, audacious goals. O’Reilly jumps back in and asks how such a program can really work when the company is so focused on winning in search. Gate’s says O’Reilly’s been paying too much attention to the press. And next question … Max Levchin from Slide: Asks what the massive audiences Facebook and sites like it have built around Web-based entertainment means for Microsoft’s cloud-computing efforts. Gates notes that whoever succeeds in the cloud-computing office productivity arena must give people the best of both the Web and desktop worlds, not one or the other. Q from Esther Dyson: Why not make health care one of Microsoft’s big, hairy goals? Ballmer says Microsoft’s core competency is software and to the extent that it can improve in that way it will. But the company feels improving the health-care industry beyond that is best left to others. Video highlights of the interview can be viewed here and here. More coverage at The Wall Street Journal and Barron’s Tech Trader Daily.